Video production workshops are offered on a continual basis. For specific classes and schedules please see the Training section of this website. FCTV manages three channels. Channel 13, the Public Access Channel; Channel 14 the Educational Access Channel and Channel 15, the Government Access Channel. In addition to programming, each channel offers a community bulletin board which provides public affairs information relevant to each channels viewership. During town emergencies or when it is critical that information be shared quickly with residents, tune in to FCTV-Channel 13 for timely information. FCTV's production facilities and equipment consist of a 600 square foot studio, a fully-equipped control room featuring the Broadcast Pix Slate 1000 Switcher, two nonlinear editing stations using the industry standard Final Cut Pro, a fleet of digital cameras, and a mobile van capable of producing multi-camera shoots from anywhere in Falmouth. Finished work may be recorded on DV tape, DVD, or as Quicktime or MPEG2 files. Members may use any of our HD JVC GY-HM150U camcorders, Canon GL-series digital field cameras or our HD Zi8 Microcams. FCTV provides you, as an Active Member, free access to our production facilities and equipment for the purpose of taking your program ideas from concept to production to completion and cablecasting. All programs produced using FCTV's facilities and/or equipment must adhere completely to FCTV's guidelines and be cablecast on the Public Access Channel, unless covered by a Rental Agreement. Access to all production facilities and equipment is available on a first-come, first-serve basis consistent with FCTV's activities, hours of operation, and guidelines. Members wishing to reserve equipment and their production crew members must be properly certified through FCTV's production courses before they may use the equipment. 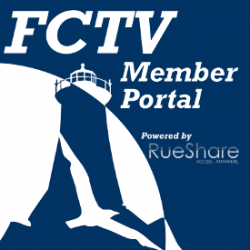 All programs must be produced or co-produced by a properly certified Member of FCTV. These guidelines and procedures are designed to insure, in as fair a manner as possible, that all persons and groups wanting to use these resources have an equal and fair opportunity to do so. You will receive a copy of these guidelines when you become a Member.